Christmas is a time for Families, Fun, and Feasting! The best part of Christmas and festive holidays has to be creating precious memories with family, friends and loved ones. Many cultures share the tradition of festive holiday gatherings simply because it’s the most precious memories one can have in their lifetime. This Christmas holiday, whatever wishes you make, may your wishes be filled with lots of new and precious memories of family and friends gathering to spend moments of laughter and joy, indulgence of festive feasts and more merriment to come in the New Year. 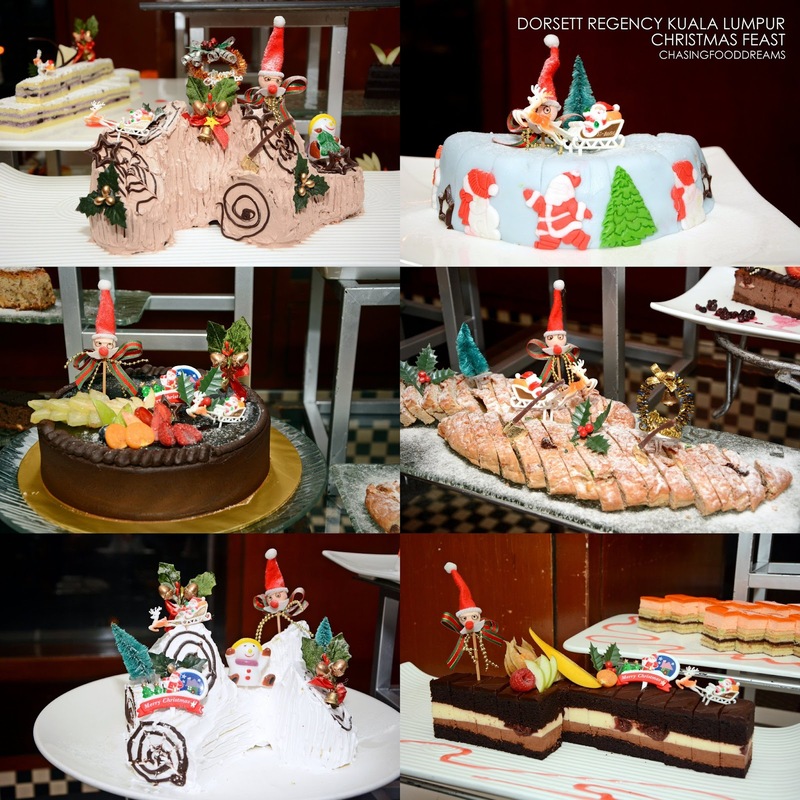 Dorsett Regency Kuala Lumpur unveils their festive cheer with ‘Twelve Christmas Dish Compilation Specials’ at Checkers Cafe. Warm up your appetites with a special Peppermint Blast Hot Chocolate that comes with a candy cane to remind us of the Yuletide season. The festive drink is not included in the buffet. Savor a feast filled with Roasted Turkey with all the trimmings and Roasted Lamb Leg with Giblet Gravy. Then count down the evening with twelve signatures Western and Asian dishes created especially for this festive feast. Kicking off the food journey is Poached Butter Fish with Roasted Nage Sauce. I happened to be a fan of butter fish. Echoing a similar texture of tuna and sword fish but smoother with a buttery note, the butter fish is cleverly enhanced with a seafood nage stock. The nage sauce is buttery and creamy, enhancing the butter fish’s flavours to greater heights. Tender Beef with Holland Onion & Blue Cheese Dressing is up next and the pairing of beef with cheese has always been a favorite of many. This dish takes on piquant strong blue cheese notes while the beef falls second in line after the cheese. I like the dish. I am biased since I love all types of cheese, even the stronger ones like Gorgonzola or Roquefort. The beef is mellow in flavours while the onion is sweet and the blue cheese sauce is a burst of flavours. This dish will work for you only if you love strong aged cheeses. Zabaglione is usually served in desserts but here at Checkers Café, it is cleverly made into a savory dish of Salmon Zabaglione. Our piece of salmon was cooked to my liking with a light medium center. Pairing up with the silky zabaglione sauce, the salmon was made even richer in flavours. A little unusual but nevertheless decent in flavors is the Grilled Foie Gras with Wild Citrus Consommé. Foie grass is wrapped in cured meat and cooked. It is served with thicken wild citrus consommé cream, a medley of vegetables and a parmesan crisp. Catering to the local taste, there is also an Oxtail Stew, Malay Style. California Mussel Bouillabaisse is mussels cooked in a light tomato seafood stick. This one is also decent and I enjoyed the seafood broth. If you can ignore its funny name, you can probably enjoy the Compressed Risotto with Bravo Chicken better. Taking on a twist on risotto, apparently the risotto is cooled and lightly pressed, then a layer of cheese is sprinkled on and gratinated in the broiler. The rice has chicken and mushrooms, giving it an earthy note with touches of creaminess. An Asian twist, the Braised Beancurd with Pumpkin is decent with comfort notes. 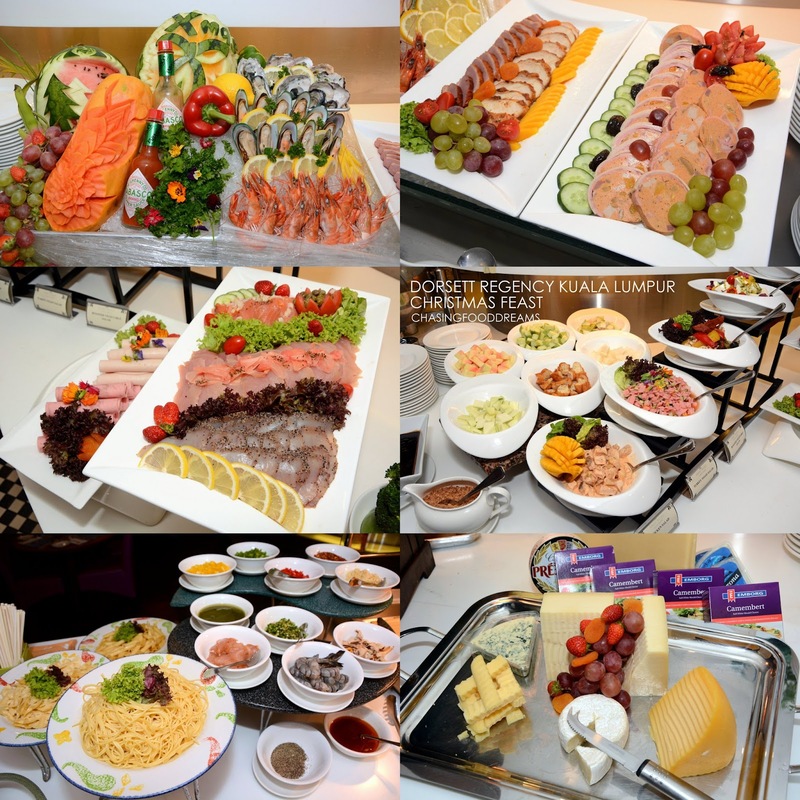 Besides all the festive dishes, enjoy other spread of Seafood on Ice, Cold Cuts and Terrine, Salad Bar, Bread Bar, Soup Bar, Pasta Station, Cheese Platter, Japanese Bar and Noodle Station. Festive cheers won’t be complete with festive treats and sweets. The desserts are created by the in-house award winning Pastry Chef Mohd Sabri Norizan. One may want to start off with the X’mas Pudding with Vanilla Spice Sauce, a warm dessert pudding studded with dried fruits and in some occasions, laced with alcohol before it is drown in Crème Anglaise for extra richness. Milk & Raspberry Bavaroise with Earl Gray Panacotta is just so pretty at sight. It’s a tedious piece of cake with all its intricate layers and combination of flavours. The Earl Gray panacotta is delightful and delicious, creating a balance between all the rest of the other flavours of milk and raspberry. My favorite of the desserts is the Black Sesame Terrine with Passion Fruit Cheese Cake. Another masterpiece that combines flavours that one would never think could go well but it did! The intense nuttiness of the rich black sesame seeds with white chocolate and dark chocolate ganache is balanced out by the tangy passion fruit mousse and sweet aromatic coconut candy base. Green Tea Tiramisu with Cherry Cake is meant for green tea lovers. It’s another great pairing as the tinge of bitter note is sweetened by the cherry cake in the center. This one is light and fluffy and easy to enjoy. Another pretty dessert, the Caramola and Pineapple Strawberry Shortcake also features a unique fruit combination. This one is so light it feels like eating fluffy airy clouds of mousse. Besides the above, there are so much more desserts on the list. Catch all the festive cakes, stolen, puddings, cookies and more! The menu is priced at RM98.00++ per person or RM190.00++ per couple for a luscious Christmas Eve and Day Buffet Dinner spread and free flow of cold Ice Lemon Tea, Coke, Sprite and chilled juices. Every diner will of course receive mystery gift to be taken home. The buffet dinner will start serving from 6.30pm to 10.30pm. After an evening of wine and dine at Checkers Cafe, patrons can continue to celebrate the Xmas affair at Window’s Lounge while being serenaded by wonderful duo resident band. During New Year Eve, patrons can come back for more partying and dining at Dorsett Regency Kuala Lumpur’s 2014 Finale Celebration. For a New Year Eve Buffet menu of RM165.00++ per person or RM300.00++ per couple by our award-winning chefs, one can enjoy with free flow of sparkling wine, beer or chilled juices. Checkers Cafe is also offering an extensive range of Christmas and New Year day brunches. The price is from RM88.00++ per person. 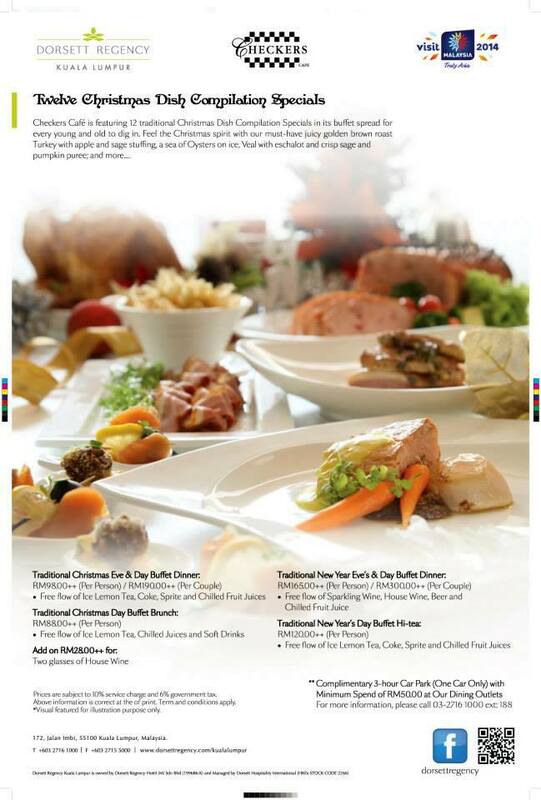 For more information on Dorsett Regency Kuala Lumpur’s Christmas and New Year feast, please may contact 03-2716 1000 ext. 188.